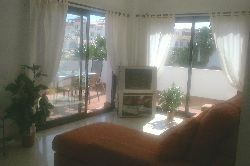 This stunning apartment is located within the quiet, gated community of Riviera Park at Riviera Del Sol. It is an ideal location with all local amenities of shops, restaurants and bars within walking distance and minutes from the beach. The apartment is decorated and furnished to a very high standard and there is everything you need to make you feel at home. 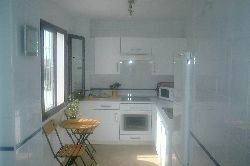 The kitchen is fully equipped and has a large utility room which has a washing machine for your use. The lounge is equipped with Satellite TV, DVD, and CD player. There is a dining area with seating for 6. The sofa can be made up as sofa bed. The lounge opens onto a very large terrace. The terrace runs the whole length of the apartment and there is access to it from large patio doors in both the lounge and the master bedroom. The terrace offers wonderful panoramic views of both the mountains and the sea and gets the sun on it all day. 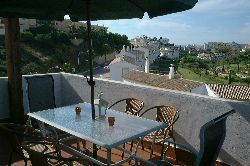 On the terrace there is a large table with seating for 6 along with a parasol providing you with the perfect place for eating outside. There are sunbeds provided to help you relax and soak up the sun. There are 3 bedrooms. The master bedroom with king size bed also has an en-suite bathroom with bath & shower. The other 2 bedrooms both have 2 twin beds (which can be made in double beds). There is secure, underground parking and lifts. 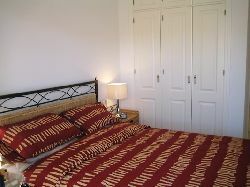 All bedlinen and bath towels are provided on arrival and must be kept in the apartment. Please provide your own beach towels. The apartment will be cleaned for your arrival and on departure. A weekly clean can be arranged at an additional cost.